What's even going on with those legs? Is he trying to faceplant his enemies to death? Get an image for big dinosaurs rather than changing the head of a scaled up raptor. How's this for leg shape? That's because nothing has, wrong image Pyro? Wow. Something went wrong with the save and I lost the file. Lemme fix that. It may just be me, but I think it would look better if the nearest leg was further back on the body than the farthest leg. Also, are you going to do four legged dinosaurs too? 'Cos that would be awesome. I'm going to save those for when (if) I sprite the distaff counterpart to these guys. Paladins with herbivores (Holy Order of Life) vs. Necromancers with carnivores (Scourge of Tsundra). Just including the poses and the spoilery sprites from the tunnel war game that I guiltfully abandoned. Here's another attempt on the allosaurus. The right leg stretches in front on the allosaurus, but on the raptor, the right leg is further back than the left leg. (06-25-2013 10:46 PM)Pyrosaurus Rex link Wrote: Is it really an issue? They kinda "bounce" forward since their feet aren't flat unmovable surfaces like ours they are more like big clawed springs of death. Back to the humanoids, some of the poses seem to be missing a right leg I'm not sure if it's some strange walking pose or if it's just something else. Other than that there's not much I can think of, I don't know if you intended it or not but your guys seem to be kinda hopping/sneaking their way forward and it looks pretty cool. So is this the only unmodified pose acceptable for walking, and the legless necromancer poses are the "mounted" poses, meaning that they're mounting the raptors, so their right legs wouldn't be visible anyway. I should probably do more with those poses to make them look more mounted. Didn't see that one, yes it's good. I was also wondering about these poses, slice. The legs shouldn't be so spread apart, especially since they're in 2/4 perspective, the legs also look very flimsy on the large dino because of how thin the legs are at the joints. The problem is the legs thighs aren't lining up, both legs end at two separate points with a good few pixels apart. That would be the human equivalent of having one side of your hip protruding several centimetres and your leg thus being several centimetres in front of the other and giving you horrible problem walks, sitting or even lying down. Take a look at these top two, I put some lines to show you how the legs are. They way they are now your dinosaurs would have to be viewed in 3/4 from behind for it to make any sense. 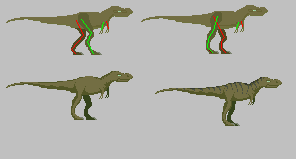 In the bottom two sprites I went a step further and did some better shading, more contrast and got rid of that strange barely visibly green and the colour used for the front leg. 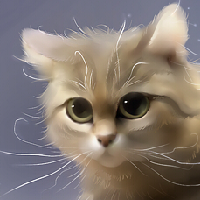 Use shading, not different colours to show where a leg is unless it's behind another leg in which case you go with a darker and more saturated colour. The shading is obviously not perfect as I did it in some 5 minutes but it works well enough, remember that most dinosaurs are basically giant squeezed cylinders with legs and arms on them and should be shaded as such. Finally on the last sprite to the low right I fixed up the legs and arms a bit and added some stripes to cover up that unused plain surface and making it look more cylindrical in the process as the stripes bend along the shape of the body. Again, obviously not perfect. Also, general rule of thumb: Shadows are more saturated than lit areas, you should also look into hue shifting for even more advanced shading. Recolored it all. Seems more undead-y now, right? I'm not deliberately necro-ing this, I swear. The Albertosaurus is now a Dilophosaurus. I'd agree with you if they weren't undead dinosaurs.